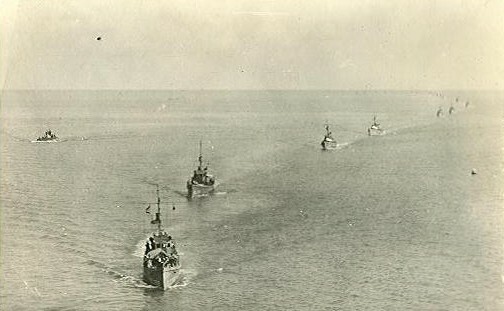 Caption: "Column of chasers entering Key West." This photo of SC 291 and other chasers is probably from the same convoy. A note in a chaser photo album from the service of William B. May, commanding officer of SC 292, indicates that SC 292 is in the lead. From set of photos purchased in Chicago in 1959 by a resident of Minnesota. Thanks to K.S. Christian for permission to post the scan.